My Printable Creation Journey - GreenandHappyMom! Early in 2018, I recently became a mom and I was fighting a PND (you can read more about it here). Because of this, working for an employer was not an option. I had good and bad days and those were unpredictable. 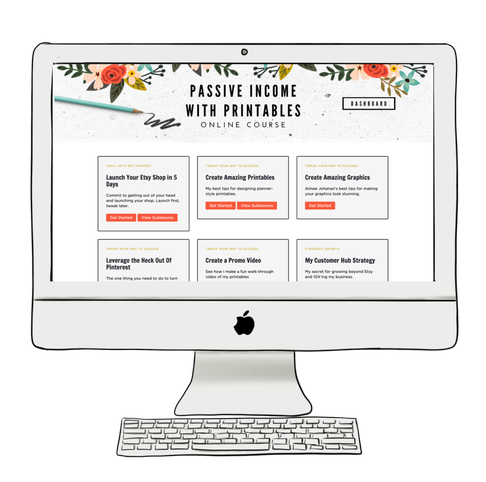 While searching Pinterest, I stumbled upon the Passive Income with Printables course, it got me intrigued. Is this something I could do? Is this for me? I have no experience with designing what so ever…. It would be great to have something to do when my other Etsy shop is slow. I kept thinking about it and whether or not it is suitable for me. In de end, I look the plunge and never regretted it. Michelle, the owner of the course, really takes you by the hand in designing your printables. Step by step she explains how she made her gorgeous printables and just by doing exactly what she did, I learned to make my own. My first creations were nothing to write home about, but that is ok. I learn by doing and as long as I am creating new printables, I learn a little more every time. She taught me all the steps to take into account when creating a printable. What works well and what doesn’t. Michelle has taught me how to get the most out of Apple pages (a Mac is not required by the way). This simple text editor program is now not only responsible for my printables but also for almost all my Pinterest pins and even some photos in both my Etsy shops (here and here). As I have learned to use this program as optimally as possible, there is no need for me to learn to use Picmonkey or Canva. Next to printables, the course also explains how to properly set up your Etsy store within just a couple of days. As Pinterest is an important part, this is also included in the course. She expains how to make Pinterest pins for your newly create printables and what to pay attention to. It even includes tutorials about Tailwind to automate Pinterest completely! Michelle constantly updates the course with new strategies to optimize your printable store. A couple months ago she added a module for the creation of digital planners to the course. I absolutely loved this part. I wanted to do this for some time now but I had no clue where to start. This module of the course thought me how to make a beautiful digital planner. A new update was also how to create a promotional movie for your printables. This is what I am currently working on in order to promote my own printables. The best part of the course in my opinion is that Michelle is always available for her students. Whenever you have a question she always awnsers them personally. How I know for sure? She often makes a video to awnser your questions which I think is so cool. It really shows how passionate she is about her course and she really wants her students to succeed. Are you by now also interested in the Passive Income with Printables course? Use the link below and receive a free printable online course tracker and €10,- discount in my printable shop, HappyMomStudio. I am sure you won't regret it. I have learned so much in this course and I am sure you will too.